If you want to give an interesting twist to a color photograph by turning it into a grayscale or black-and-white image, try reaConverter's set of image editing tools and you will achieve this in seconds. This powerful software provides an entire set of image manipulation options when you plan to switch to black-and-white. This editing tool is also particularly effective for correcting scanned black-and-white images, which usually tend to be large in size and not particularly clear. With just a few clicks you can visibly improve contrast, making scanned images look cleaner and clearer, while significantly decreasing their file size. First, open all the images you intent to edit. 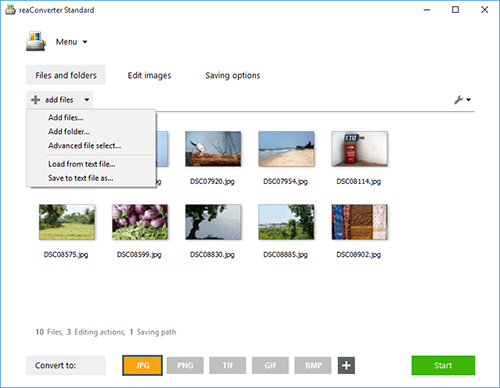 You can do this via the software's handy drag-and-drop feature, you can add them one by one from your computer or add entire folders with images. Next, go to the Edit images tab, and press Add action → Color adjustments → Black & White. You will then be able to choose between several options for turning your images to grayscale or black-and-white. The dithering method and the Floyd-Steinberg algorithm will provide a conversion in which the original color tones are reflected in shades of gray, whereas the Auto mode will polarize the entire image between pure black and white. 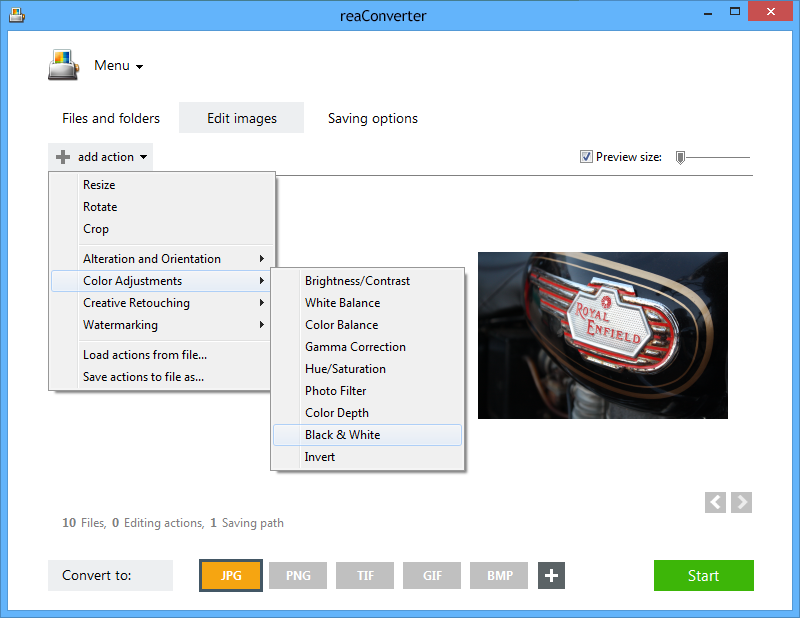 Additional conversion methods are also available — try them out and see how they work on your images in real time, by clicking the Preview button. Finally, decide if you want to convert your images to a new format and choose a location for them. For the former task, simply click on one of the buttons conveniently placed at the bottom of the window. For the latter, go to the Saving options tab and choose if you want to save your new images locally, in the source folder, a subfolder or in a customized location. 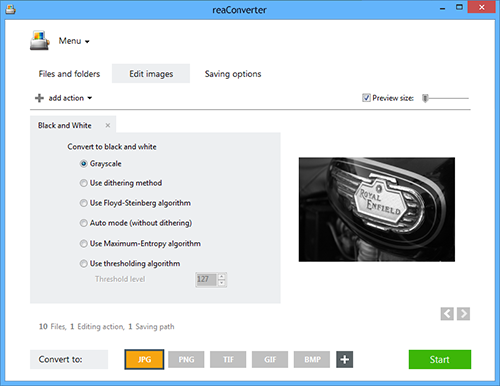 reaConverter's latest version also offers the possibility to save directly online, in your Google Drive cloud or using your Box.net account, among others. When this is done, simply press Start and check the dialogue box until all your files are edited and converted. It shouldn't take more than a few seconds. Command-line black&white tool is an advanced feature meant for professional use, and is available in Pro edition only.